Unfortunately, if you have ever grilled shrimp on the grill, you know how easy it is for them to go from almost-raw to over-cooked and rubbery. And as much as I love my husband, he hasn't mastered the art of not over-cooking fish on the grill (although he is getting good at grilling salmon on a cedar plank). I started making my shrimp skewers in the oven recently and they have been turning out fabulous. Best part is, my husband doesn't seem to mind because now he doesn't have to worry about my “icky” shrimp being near his manly beef on his grill! (just kidding). 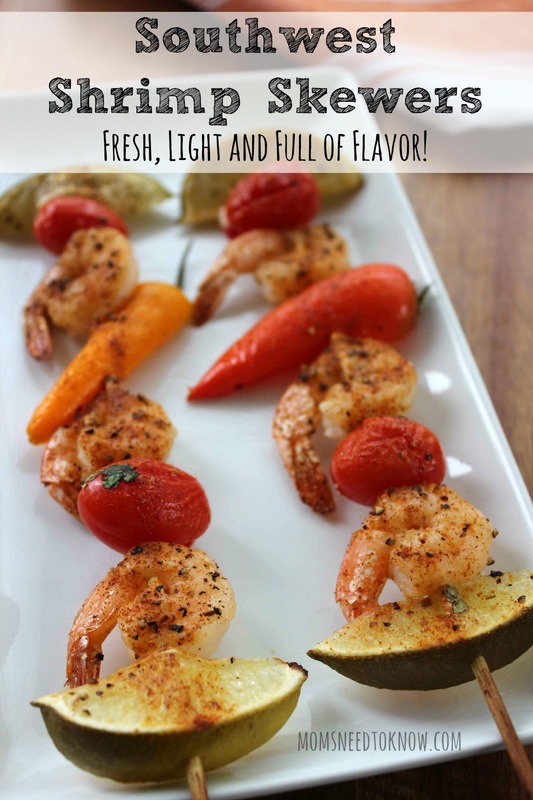 As it often is with cooking and grilling, it all comes down to the marinade or seasonings and these Southwest Shrimp Skewers pack plenty of flavor in each bite! This flavor combination is so simple, but delicious! You will notice that I don't specify which kind of chile peppers to use. That is actually intentional. There are many kinds of peppers out there with varying degrees of heat. You may only be able to tolerate a chopped-up bell pepper. As for me? I will go with a jalapeno or serrano pepper. You know your tastebuds and what you can tolerate better than I do, so choose accordingly! Cut the limes in to 8 wedges. Split and remove the seeds from the peppers. 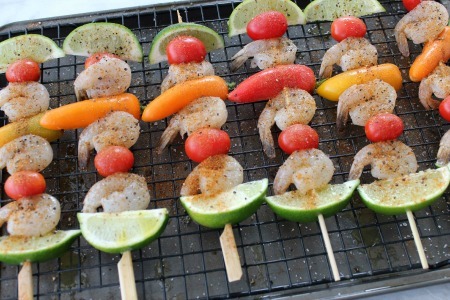 On each skewer, place a lime wedge, followed by a shrimp, a pepper, shrimp, tomato and then another lime wedge. Place skewers on an oiled rack (I actually have an old cooling rack that I use for this) over a baking sheet. Drizzle the skewers with the olive oil and season with salt, pepper and spices. Bake for 8 – 10 minutes in a preheated 400F oven or until done. Serve and enjoy! 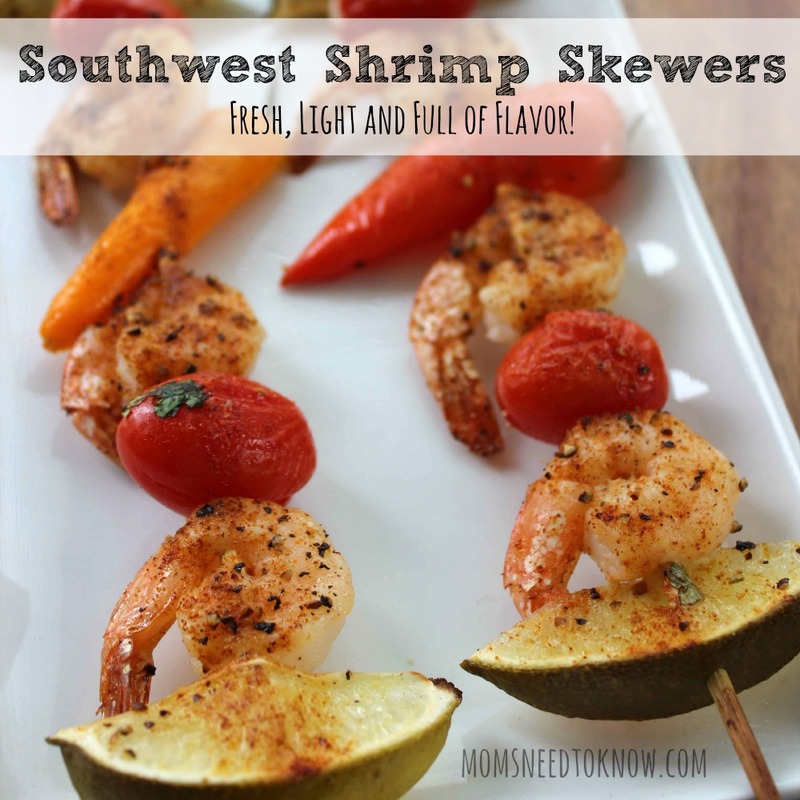 Southwest Shrimp Skewers | Great Grilling Recipe! 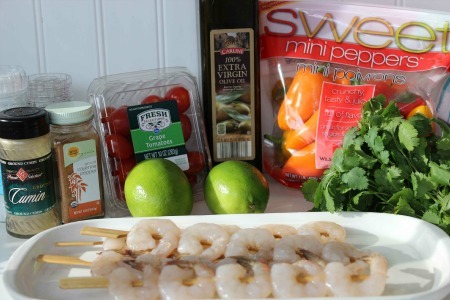 These Southwestern Shrimp Skewers pack plenty of flavor in each bite! This flavor combination is so simple, but delicious! Serve them over rice for a great meal! Cut the limes in to 8 wedges. Split and remove the seeds from the peppers. 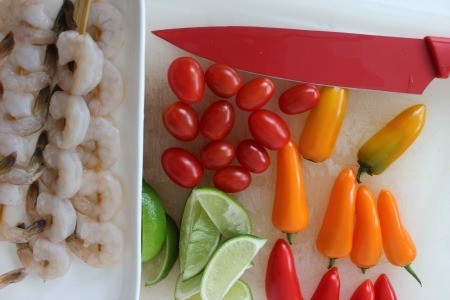 On each skewer, place a lime wedge, followed by a shrimp, a pepper, shrimp, tomato and then another lime wedge. Place skewers on an oiled rack over a baking sheet. Sprinkle with chopped cilantro and serve and enjoy over rice! Thanks for joining us at Delicious Dishes party!! I am all about the grill in hot weather (sometimes in cold)– and what’s more fun than food on a stick??? ?